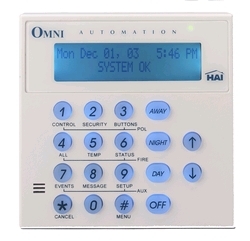 Every Omni family home control system is required to use one of these Omni Consoles or an Omni Console with Built-in Speaker/Microphone (HAI Part Number 33A00-4). It features a 48 character cool blue backlight LCD display with menu operation, backlit keys, selectable keyclick, beeper functions and viewing angle. A two-color LED offers status at a glance: red for security armed, green when disarmed. All control, security and programming functions can be accomplished using a Omni Console. It has Silk Screen with the menu options printed on the console face.